Dublin: some people hate it, others love it. For us, as for lots of others, Dublin was the beginning and the end of our 3 weeks holiday in Ireland; we arrived here with the ferry from Holyhead. Because we wanted to see so much of the rest of Ireland, we ended up with the almost impossible mission to explore this marvelous city in just one day. The city is divided in two equal pieces by the river Liffey. The southern part is the medieval city. And the northern half has a special atmosphere, and a lot of shops. 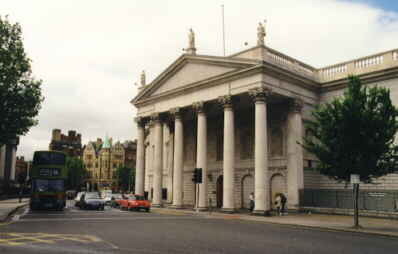 There a so many buildings in Dublin with columns, you begin to wonder if it has been built by ancient Romans or Greeks. Of course, this isn't true. The Dubliners just like columns, we think. This building was once the House of Parliament, but since 1800 it houses the Bank of Ireland. A lot of buildings in Dublin are quite nice, but the first floor is usually spoilt with enormous windows and advertisement. When you risk a sore neck and look above constantly, you'll find out there are a lot of beautiful buildings here. 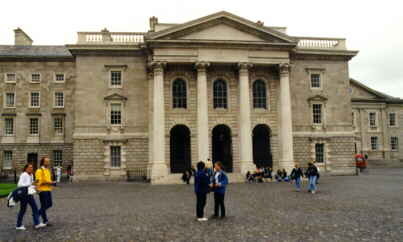 Just across the street from the Bank of Ireland is Trinity College, the old university buildings in the city. Here are more tourists than students for two reasons: 1: you just have to see the book of Kells and the Old Library, and 2: it's the tourist season. This is a combination that is not unusual in Ireland: an antique-shop where you can have some food. Or, is it a restaurant that wants to get rid of the old furniture ? 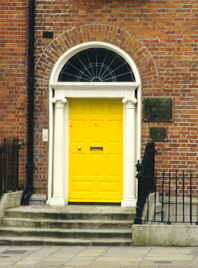 Though there are not many splendid buildings in Dublin, there is one thing special: the colourful doors. 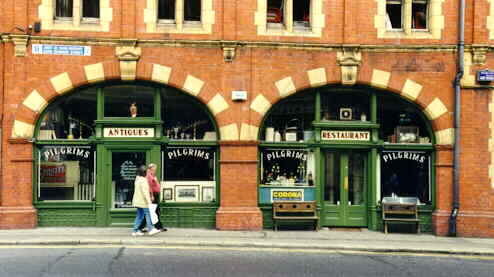 Most doors are painted in bright colors and some have extra features: pillars, a circular window above the door, a big doorknob. One day is not enough to see Dublin, so we'll come back someday to see more.